A Lack Of Interpreters Can Mean Subpar Care For Immigrants : Shots - Health News Despite laws guaranteeing access to health care, non-English speakers in the U.S. often rely on family and friends as ad hoc interpreters — and may misunderstand what doctors think they're conveying. Marlon Munoz still becomes emotional when he remembers having to tell his wife, Aibi Perez, that she had breast cancer, because no other interpreter was available to share the news. A few days after Perez underwent a routine breast biopsy 17 years ago, Munoz received an unexpected call from her physician. The doctor spoke no Spanish and Perez spoke little English, so they called Munoz, who could act as a go-between. But when the doctor said the biopsy had revealed stage 1 breast cancer, Munoz hedged. Without delivering the bad news, he left work and drove to a park near the family's home in Pennsauken, N.J. He sat on a bench and sobbed. 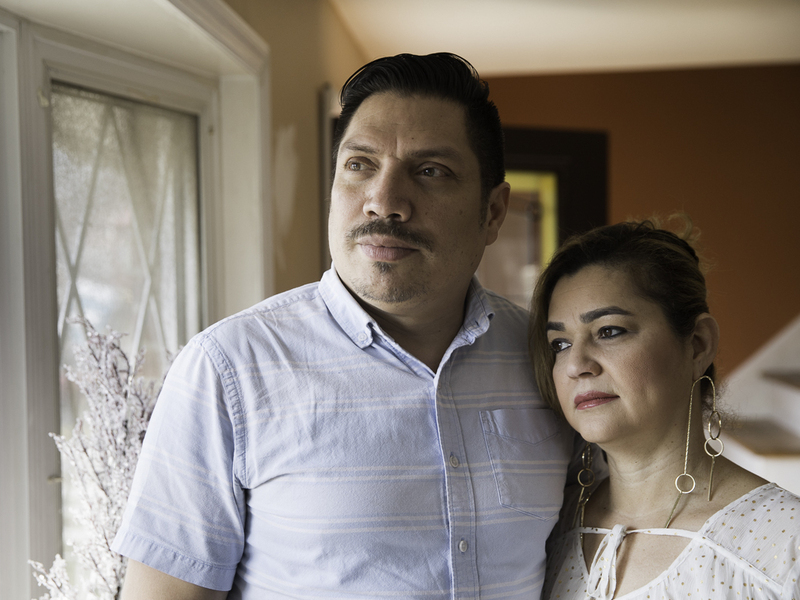 When he finally mustered the strength to go home, knowing Perez and their children were preparing for the next day's Thanksgiving feast, he struggled to find the words. "You don't have to tell me," Munoz recalls his wife saying. "I already know." 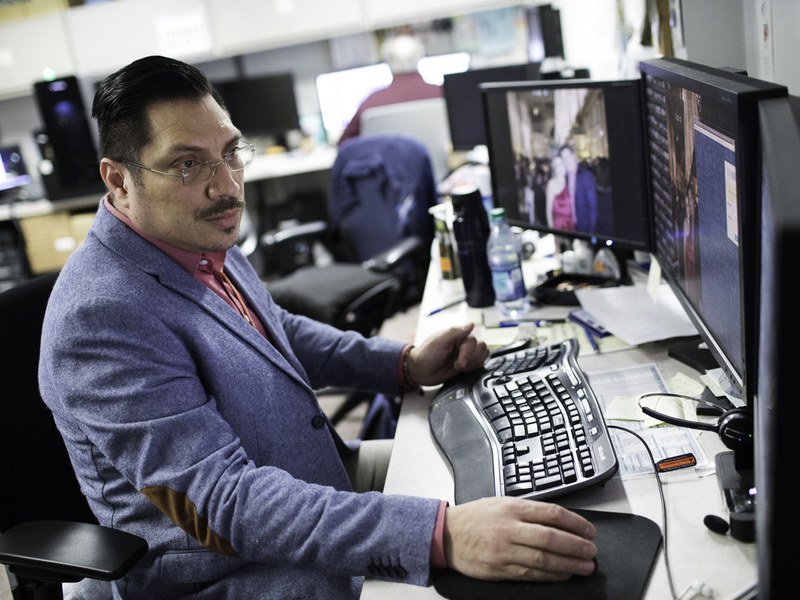 "That's when I broke into tears," says Munoz, who now works in the radiology department — and as a volunteer medical interpreter — at Children's Hospital of Philadelphia. Perez survived and is cancer-free today, but the family has never been the same. Being the bearer of bad news strained Munoz's relationship with his wife at this most vulnerable time, and years later, they say they still wish it could have been handled differently. Census data suggest that as many as 1 in 10 working adults in the U.S. has limited English-language proficiency. Meanwhile, the 1964 Civil Rights Act and subsequent orders and laws require hospitals and other facilities that offer medical services and receive federal funds to provide "meaningful access" to patients, so they can make informed decisions about their health. With few exceptions, this means that providers must offer qualified interpreters, as well as translations for prescriptions and other medical documents. "It's the law," says Munoz. Previous research has suggested that such accommodations improve clinical outcomes and reduce persistent disparities in health care overall. And yet, despite the law, and despite the obvious benefits, thousands of hospitals and other medical facilities continue to fall short, leaving patients — if they are lucky — relying on family members and friends to be ad hoc interpreters of maladies and medical care. It's an informal and imperfect form of triage that unfolds in clinics across the country every day, with potentially harrowing consequences should something be lost in translation. Munoz works in the radiology department at Children's Hospital of Philadelphia. He also serves as a volunteer interpreter between English-speaking doctors and Spanish-speaking patients. No one really knows how widespread the problem actually is, but even the scattered data that are available paint a bleak picture — and one that has persisted for decades. Just 39 percent of hospitals, for example, reported collecting any kind of data on the language proficiency of patients in a 2004 survey of 272 hospitals. Last year, a study published in Health Affairs suggested that little had improved. Despite requirements for data collection on race, ethnicity and language needs outlined in the 2010 Affordable Care Act, the researchers determined that such data availability in commercial, Medicaid and Medicare managed care plans "remained largely incomplete." A 2016 survey of 4,586 hospitals by the American Hospital Association, meanwhile, suggested that only 56 percent offered some sort of linguistic and translation services, a very slight improvement over the 54 percent recorded five years earlier. Yet, another survey suggests that 97 percent of physicians see at least some patients who have difficulty understanding English. "The reality is, if you can't communicate with a patient, you can't provide care," says Mara Youdelman, managing attorney at the National Health Law Program in Washington, D.C., who works on language-access issues. "It shouldn't be an add-on," she says. "It should be a required part of providing high-quality health care." Gabriela Jenicek, the director of language services at Children's Hospital of Philadelphia, remembers one young mother-to-be who was eight months pregnant and at high risk. The woman had been referred to Jenicek's hospital from another clinic, which had allowed the woman's sister-in-law to interpret her doctors' words. Providers at the clinic told the sister-in-law that the woman's fetus was at risk of heart damage. But the sister-in-law never told the mother-to-be, Jenicek says. In blissful ignorance, the pregnant woman had enjoyed her baby shower and even prepped a nursery. When they arrived at Children's Hospital of Philadelphia, "she had to be told the child would not make it," Jenicek recalls. "She had no time to prepare." Research over the past 15 years has established that language errors and misunderstandings are common when professional interpreters aren't used. A 2010 report by the University of California, Berkeley School of Public Health and National Health Law Program found that of 1,373 malpractice claims, at least 35 were linked to inadequate language access. In one case, a 9-year-old Vietnamese girl was rushed to the emergency room with what appeared to be a bad case of the stomach flu. Her parents spoke no English, and no on-staff interpreters were used — even when the doctor prescribed a medication that isn't usually recommended for children. Instead, hospital staff communicated in English with the girl and her 16-year-brother, and the family was sent home with written instructions — also in English — to return to the hospital immediately if the girl experienced certain side effects. The girl had an adverse reaction to the drug, suffered a heart attack and died. The physician and hospital settled the malpractice claim for $200,000. Even short of death and injury, more recent research indicates that without trained interpreters, patient satisfaction and outcomes can plummet. A 2016 review of palliative care services, for example, concluded that patients who struggle with English don't adequately grasp their diagnoses without professional interpreters and also had more pain and anxiety. A 2017 survey showed that 46 percent of dental students do not feel adequately prepared to treat patients whose primary language is not English; 44 percent said their dental school clinic did not have formal interpreter services. Perhaps most alarming, today's medical school students appear to be getting the message that language-access issues aren't important and that they will be easily forgiven for a lax approach, according to a recent study published in Academic Medicine. That study, co-authored by Dr. Alexander Green, a physician and an associate professor at Harvard Medical School, concluded the problem stems from "a learning environment and organizational culture that value efficiency over effective communication." In an essay published in the American Medical Association's Journal of Ethics, which devoted its entire March 2017 issue to language access, Green called for a "major culture shift" in medicine, on par with the shift in expectations of hand-washing. "It needs to be not only easy," Green said in an interview, "but an expectation." Fiston Laka Bondjale was given political asylum in the U.S. almost two years ago after living in Congo, but he knew the language barrier would make it difficult for him to seek treatment for chronic stomach pain. "Every time I think, 'What can I tell the doctor?' In French, I can explain it easily," he says. "But I'm afraid to go to the hospital because maybe I'll get the wrong medicine." The one time Bondjale did go to a hospital in Washington, D.C., he and the doctor struggled to communicate because no French interpreter was on site. "I asked him to use simple words, but that was hard for the doctor," he says. When he moved to Minnesota, he couldn't sleep, but he still resisted seeking medical help because of his rudimentary English. Finally, a fall on the ice prompted a trip to a clinic, where he was able to use a phone-in French interpreter. For such patients, success in navigating the medical system depends on a variety of factors: Which state you live in; whether you are in an urban or rural area; how many people speak your language nearby. As it stands, there are no universally agreed-upon standards for training or licensing interpreters. Patients and providers often don't understand the law, and there is little funding for enforcement. Recent surveys of doctors show that expectations for language access are far from the norm. Of 1,563 physicians surveyed between 2011 and 2016 by Critical Measures, a consulting company in Minneapolis, roughly half were "relatively unfamiliar" or "unfamiliar" with the legal requirements of working with interpreters. Meanwhile, the Trump administration's tougher stance on immigration has created an atmosphere in which immigrants have become more hesitant to speak out, according to Dr. Glenn Flores, who leads the Health Services Research Institute at Connecticut Children's Medical Center and has spent years studying language access in health care. "The policy landscape is as bleak as it's ever been," Flores says. Even in big city hospitals that are more likely to offer language services, getting a professional interpreter isn't a given, and for patients, there's little in the way of recourse. Filing a complaint requires knowing about the Department of Health and Human Services' Office for Civil Rights and having the communication skill, or the assistance, to report a violation and seek a remedy. The office received just 210 language-access complaints during the five-year span ending in 2017, an HHS spokesman reported. But according to Leon Rodriguez, the former director of the Office for Civil Rights from 2011 to 2014, such numbers mask the real contours of a problem that is difficult to address. "When you think about housing discrimination, it's sort of clear: You don't want to get caught renting to one family and not another," Rodriguez says. "Language access is softer. It doesn't have the same shock value." Resources at the agency are also stretched thin. Roughly 120 investigators on staff cover all civil rights issues, including discrimination on the basis of gender, disability, age or race. Administrators there do have the power to withhold federal funds for failing to provide adequate language services, but virtually everyone agrees that too many cases slip through the cracks — even though language services have real financial benefits, too. While a true cost-benefit analysis hasn't been done in the United States, some studies have identified an association between the availability of language and translation services and fewer readmission rates and fewer malpractice claims. A 2017 study, for example, found that an academic hospital could save an estimated $161,404 each month by avoiding 119 readmissions when patients had consistent access to interpretation. "The larger, forward-looking health care providers understand that language access benefits bottom lines," says Bill Rivers, executive director at the Joint National Committee for Languages. But they may also be the only facilities that can really afford it. One day last fall, interpreter Muhiyadin Aden navigated the labyrinth of hospital buildings at Hennepin County Medical Center in Minneapolis — a big, urban hospital known for its language services — and eventually arrived at the blue- and orange-hued halls of the emergency department. Aden opened the door to a windowless exam room, where a Somali woman wearing a hijab and a floral skirt was lying on the exam table, her left ankle encased in a walking boot. Her sister sat across from her. A nurse walked in with good news: The X-ray hadn't shown a major fracture. As Aden interpreted, the woman's face lit up. "Good, I'm happy!" she said in Somali. The nurse, looking at the patient, continued: "You can sleep on it, you can walk on it; it's for comfort," she said of the boot. Aden's voice was animated and he used gestures as he interpreted. The patient's face showed relief: "Ah, ah!" Although naproxen is an over-the-counter medication, the nurse gave the patient a written prescription, highlighted and folded so she could hand it to the pharmacist. Depending on the time of day, the nurse knew that there might or might not be a Somali-speaking pharmacist working at the center's pharmacy. The thorough approach takes time. One survey showed that 85 percent of community health centers spend more time on patients with limited English. At Hennepin County's hospital, former interpreter services manager Michelle Chillstrom, who now works at the University of Washington Medical Center, estimates exams with interpreters take 50 percent longer. In other words, hospitals and clinics need to be comfortable with the idea of doctors seeing fewer patients per shift. A movement known as value-based care, in which providers are paid for outcomes instead of the frequency of services, could pave the way for improved language access, says Green, the researcher who studied med students' perceptions of language access. Such a system would provide rewards based "not just on the number of visits each day, but on the quality of care and outcomes," Green says. In such a scenario, hospitals would be penalized if a patient had to return more than once because a language barrier led to a treatment problem. Technology is helping to address language barriers — though it remains imperfect. One study, for example, pointed out that in some British medical contexts, having seizures is sometimes referred to as "fitting" — as in, "having a fit." But one Swahili language app translated the English "Your child is fitting" to "Your child is dead" in Swahili. At Children's Hospital of Philadelphia, locally referred to as CHOP, staff members say that the app translates the phrase "Please come to CHOP" as "Please come to be cut into pieces." There is no doubt in Marlon Munoz and Aibi Perez's minds that their health care has been compromised because of language barriers. Some services simply weren't available in Spanish when Perez was being treated for her breast cancer — no Spanish-speaking psychologist to help Perez understand how the chemo worked, for example, and no Spanish-capable pain manager. Worse, though, was the confusion and pain that ensued after Perez finished chemotherapy. She had been given a choice between a variety of medications for controlling the hormones relevant to her type of breast cancer or surgery to remove her ovaries and accomplish the same. Not understanding much about the pros and cons of each choice — and feeling too young to have her ovaries removed — Perez opted for one of the medications. "That was our first mistake, just to take everything they told us and just take all the information — a lot of information with medical terminology about something you didn't know," Perez now says. "You don't know what they're giving you, the side effects you're going to get." That first medication caused blue and purple marks all over her stomach and violent mood swings. "In the morning she'd be happy, and then later I'd say, 'Hey, how do you feel?' and she'd break into tears," Munoz remembers. Next, they tried a medication that made her skin feel so tight that she would shriek at the accidental touch by one of her kids. Finally, they tried a medicine that had to be injected monthly to her stomach with a needle "as thick as a pen," Munoz says, leaving her stomach blue. After a year of experimenting, Perez decided to have the surgery. "If we had understood [the consequences]," Munoz says, "we wouldn't have had to go through that year of pain to make the same decision in the end." Sheila Mulrooney Eldred is a Minneapolis-based freelance writer. This story was produced by Undark, a nonprofit, editorially independent digital magazine exploring the intersection of science and society.